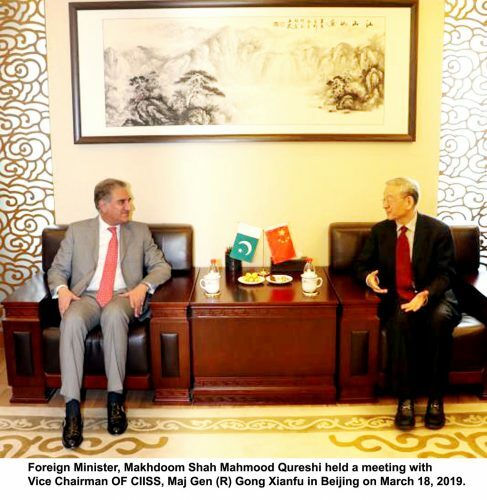 ISLAMABAD (92 News) – Foreign Minister Shah Mahmood Qureshi on Tuesday called on Chinese Vice President Wang Qishan in Beijing and discussed bilateral relations including progress on China Pakistan Economic Corridor project. 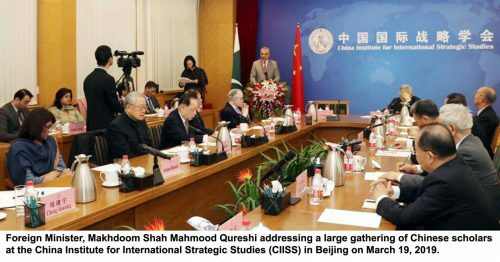 Speaking on the occasion, Shah Mahmood Qureshi said that Pakistan desires cordial relations with all the neighboring countries. Earlier on Monday, Foreign Minister Shah Mehmood Qureshi reached Beijing on a three-day visit to China. Earlier, Foreign Minister Shah Mahmood Qureshi has said that India did not respond positively to Pakistan’s efforts for peace. Addressing the Business Leaders Summit in Islamabad on Wednesday, he said that the situation is still tense on the eastern and western borders of Pakistan. He said that the objective of the PTI government is not to make properties and accounts abroad. “We are hopeful of overcoming the economic challenge,” he said. The minister said that the government is taking steps to create investment opportunities in the country and these steps have already paid the dividends. “The United Arab Emirates (UAE) is taking keen interest in making investment in different sectors in Pakistan while Qatar also plans to invest in the country’s food processing industry,” he said.